It’s been a while since we’ve had a giveaway, and many of you just completed studying Psalm 118 with us at MamasRefill.com, so we would like to celebrate — just in time for Christmas! Give a membership to a friend, or use it yourself and enjoy 12 months of access to 20+ inductive Bible studies all planned out for you, and a community of women who are studying along with you. You’ll love the new studies and other developments coming in 2019! 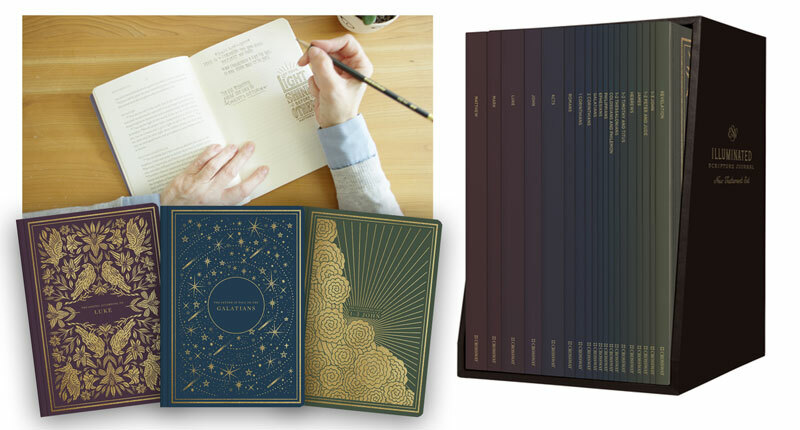 Includes eight 30-day study booklets plus a Moleskine journal, non-bleeding fine tip pen, and Prismacolor pencil set for Bible marking. 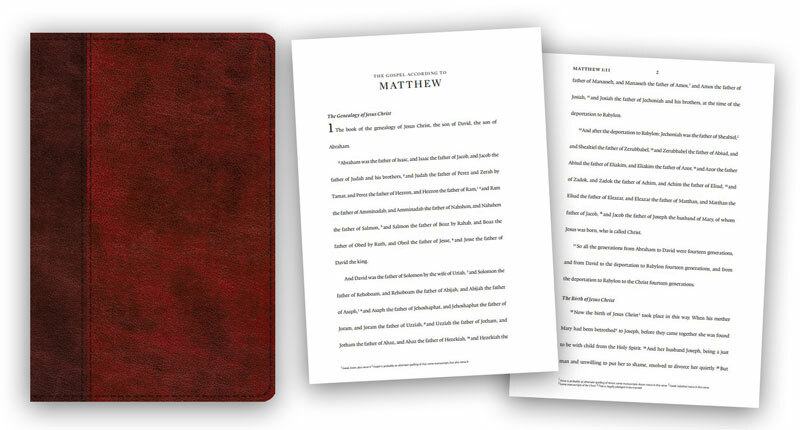 This beautiful set has a separate booklet for each book of the New Testament, with lots of blank pages for your notes, drawings, etc. Someone is going to have a lot of fun with these! Here’s an ideal Bible for inductive study! It has wide line spacing, just like the printouts we’ve been using for marking up a passage and making notes. 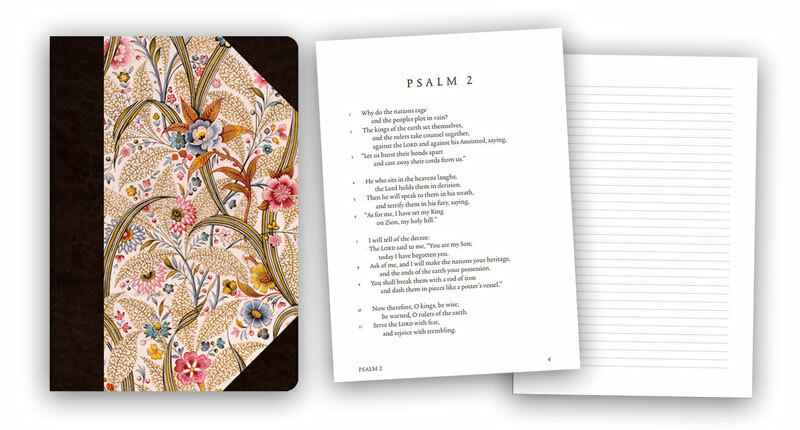 We’ve enjoyed using this lovely little booklet containing simply-formatted Psalms alongside lined pages for journaling and Bible study notes. One entry per person; giveaway starts 11/30/18 and ends at midnight PST on Tuesday, 12/4/18. Comments will be drawn randomly for each prize and winners will be notified by email. Winners will have 48 hours to respond and claim their prizes. Shipping costs outside the United States, if required, will be the responsibility of the winner. For Mama’s Refill members: How has your membership in Mama’s Refill influenced your enthusiasm, skill, or consistency in studying God’s Word? For those who are not Mamas Refill members, what tools and resources do you use that help you stay engaged and growing in your study of God’s Word? Just answer one of these questions in the comments below by Tuesday, December 4! I haven’t been using Mama’s Refill much, so I’m not as comfortable with it as with going to the blog for Bible Study posts. But I’m not giving up. My best, most consistent, & fruitful Bible study times are when I’m doing one of your studies or REVIEWING my journal notes from a previous study. What do you think we could do that would make Mama’s Refill easier for you to use, Janet? My most productive and useful Bible study times are when it’s quiet and I can focus on my journaling in my Bible. I also use devotional books to help me focus on the study itself. I love to use my colored pencils and Doorposts Busy Mom Bible studies. Also I love to listen to our pastor’s sermons and take notes with scripture. I have not used Mama Refill, but am currently enjoying a neighborhood Bible study using Kathleen Nielson’s books (currently Proverbs), and at home I’m currently going through “It Had to Be Jesus” by Kat Lee. Thanks for the opportunity to win! I would LOVE to be a Mama’s Refill member but with a tight budget it just hasn’t been something I am able to do right now. The tools I use now are Bible studies I find at the thrift store or at my library. I also print off monthly scripture writing ideas. We homeschool so during my kids handwriting time I sit down and write my verses out, so we all have handwriting to do 🙂 I have also participated in the Good Morning Girls bible studies when it seems like something that I want to learn more about. I would be a newbie to Mama’s Refills. What keeps me engaged in God’s word is definitely giving time to reflect on specific passages. I like drawing pictures of the verse and writing down the Greek or Hebrew word. I also like using any history during the time period the book was written sometimes helps me reflect a bit more. Love these studies too! Some of the best ones I’ve done. The pictures help, don’t they? That’s something I really enjoy doing as part of my Bible study. I’ve enjoyed using mama’s refill! It’s been a helpful reminder to receive emails every morning. And it’s been an encouragement to learn more how to study God’s word more in depth. I truly enjoy all the new studies! I use Precept studies and Blue Letter Bible to help me stay engaged and growing in the Word. My favorite resources for Bible study are the sites Blue Letter Bible and Bible Study Tools – and many thanks to Pam for showing me how to use them through her wonderful studies! I’m not yet a Mama’s Refill member, though I hope to be soon! Right now my favorite way to study and dive in the Word is to review the scriptures from our Sunday sermon at church. I’ll read the Chapters in context. That will usually lead to bunny trails and little nuggets He will share with me. My love for studying has grown significantly since learning that I too can study it on my own and gain deep, rich insights from scriptures with the Holy Spirit’s guiding; I don’t have to be spoon fed! I love opening the Word and seeing what depth is waiting for me today! It truly is safe enough for a baby and deep enough that you can drown (never reach the bottom). It’s deepened my appreciation for the Word – that God gave us this to help us, to show us His love for us, to show us how to obey Him (not just guess at what pleases Him) and to show us that we are not alone in this walk. He is with us every step of the way. Bible study becomes so much more exciting and personal when we learn how to dig for treasures on our own! I would love love love to be a member of mama’s refill. I have followed Doorpost for more than 10 years and love everything y’all do. To study inductively I need everything. I use my bible app to read because I like hearing the word as I read it. I also love my MacArthur Study Bible. My Sharpie pen and ruler are my favorite two tools for Bible study. As a busy momma of 10 my Bible study happens in little snippets throughout the day. I use bible letter bible mostly, my journaling bible and notebook. I’m not a Mama’s Refill participant but I would love to be. I’ve done several of Pam’s Bible studies and have thoroughly enjoyed each one. Thank you so much for teaching me how to study, especially how to use online resources. I appreciate you! I use a journal, and Study Bible. I have greatly appreciated your studies in the past, by the way! Great work. I use my Bible app to read through the Bible every day. Some days I take time to journal about what I’ve read, or write out key verses. I also read a separate devotional by Paul David Tripp (New Morning Mercies) and it always challenges me. I have also been working to get into a routine of journaling my prayer requests. If I just think them, my mind wanders. But if I take time to write them out, I find my time to be more focused and fruitful, and I feel closer to God in those moments. Having a reading plan, pretty journal, and keeping my supplies (Bible/journal/pens) in one spot help me to be more consistent in my quiet times. For those who are not Mamas Refill members, what tools and resources do you use that help you stay engaged and growing in your study of God’s Word? I live on BlueLetterBible’s website studying the Hebrew/Greek usages of Scripture. God has revealed Himself mightily through word studies, which has made His Word come alive that much more in my life. I can get lost in His Word for hours through this process. I haven’t always been confident in the Scriptures, but now that I am in the Word simply for God to reveal Himself to me personally and intimately via His Holy Spirit, I find great contentment, peace, and humility in His presence. So thankful that He meets us where we’re at and gently and lovingly draws us into relationship with Him. He is certainly worthy of all glory, honor, and praise! Word studies! Yes! They’re addictive, like a treasure hunt! The tools and resources that I currently use that help me stay engaged and growing in my study of God’s Word is the First 5 App. I have not been a paid member of Mama’s Refill, but participated in several of the studies prior to becoming Mama’s Refill. I love the Busy Mamma studies. Pam’s approach to the Scriptures is a tool all in itself and I’ve had the privilege of sharing that with other ladies. One thing that has helped tremendously is that for about three years now a friend and I have been reading the Bible together. We do a chapter a day, note cross-references, and the verses that stick out to us. We then meet once a week and go over what we learned. What a difference this accountability has made! This is a great idea, Jennifer! Studying with someone adds so much to our study, and it helps keep us on track! I write out Scriptures to help me remember them, participate in online Bible studies, and I study for sermon preparation each week. I have loved doing the busy Mama’s Bible studies! Pam makes it so easy to study the Bible and I love the tools she has showed me to do the studies on my own! I love blue letter Bible and my pretty coloured pens:) with my journal! I honestly don’t currently use any resources except for God’s Word. I would love to try some of these study materials! I love that I can work at my own pace whenever it is a good time for me. But the best part of being a member of Mama’s Refill, is what it has done for my daughter. She sees me doing it every day, and she wants to be a part of it too! That has been an absolute joy to see and so humbling at the same time. I use Journaling as a way to stay engaged in His word. I have a devotional, too. I am not good about getting in the Bible everyday though. I feel like I need more but am having an issue finding the time between work and 6 kids. I am open to using different ways to getting the word in everyday. Thank you for the giveaway. The mamasrefill site has been a blessing to me. It keeps me on track to study and finish a passage. I was introduced to blue letter bible thru studying here. Thankful for Pam being a mentor to all of us. I honestly struggle to stay consistent in the Word. As a ministry leader, this is a humbling realization and one I am actively figuring out to change. I always do best with studies that are short but deep and include time and space for reflective writing. I love using the Mama’s Refill studies!! I can work at my own pace, especially when life becomes relentless and demanding, being able to pick up in a study where I left off, is great! I find that having the studies laid out for me encourages me to study more often. I appreciate having the studies available and doable! I mainly try to spend time in the Word, just reading and meditating on Scripture morning and evening – but, now that I’m an older mama of a large family, and no longer have little ones requiring my attention every other minute throughout the day, I indulge in listening to, or reading, sermons mid-day during the week. I’ve always tried to have wonderful books going also – theology, characteristics and attributes of God, studies in a particular book of the Bible. I still do, but have truly enjoyed, lately, getting to hear these extra sermons. I am in a wonderful series on Job right now. I find that the best way for me to stay in the Word consistently is when I commit to study a book or passage of Scripture with someone else or a group of people. The accountability really helps keep me focused and disciplined to study each day/week. Also, I love using the BibleHub app which combines the text in several versions and commentaries all in one place on my phone. I have thoroughly enjoyed my membership. It has been nice to select from several options of studies when I am ready for a new study. I believe it has improved my time in the word. These studies have certainly given me a passion to learn more deeply about what I am reading/studying. I also feel more equipped to study passages on my own using the methods I have been taught in your studies. I have LOVED the Busy Mamas study books and the shorter studies that were on Instagram. Though I am not a mamasrefill member, the tools you have taught me continue to bless me as I study God’s Word. The missing ingredient in the independent study is the blessing of community which I highly value. Iron does sharpen iron. I find online studies and copy scripture to memorize~thank you for the opportunity! I use different Bible versions in physical book form to stay engaged, plus my trusty ESV with an excellent concordance. Also, regularly/weekly meeting with a group of ladies has been essential to growth. I need that accountability. This is the first I’ve heard of Mama’s refill. Lately I have been doing YouTube plans with other ladies online. I love the booklet you show of psalms with the lines for notes. I was introduced to Door Post through a friend on FB. Mamas Refill helps to remind me, gives me a format to study, encourages me, gives me a deeper understanding of passages and gives me a community of ordinary women seeking after God. I am thankful for your work to bring all of this to me. I have not been using the Mamma’s refill. I must confess that since the busy Mamma’s studies aren’t free anymorei haven’t been as faithful in really digging in to Scripture. I do use the blue letter Bible app yet when I do dig in. I use Blue Letter Bible and some booklets from Doorpost. It has been such a blessing and a joyful time to dive deeper in to the word. I have also really valued learning to use the Blue Letter Bible app. I have also been taking my daughter through a study using the site. I am involved in Community Bible Study which helps me to stay in the Word. I also homeschool so my kids and I read the Bible daily. My kids’ books have really helped me to understand the Bible better! I only recently joined Mama’s Refill but I’ve done several of the Bible Studies through email in the past few years. I love them because I feel like they equip me to maximize my minimal time available for Bible study. The way our family has chosen to stay accountable to be in the Word is through Bible Study Fellowship. Our entire family attends. I have used your study methods on some of my BSF studies (for example, word study using Blue Letter Bible) & it’s made the study even richer. Your study of Psalm 91 in the spring of 2017 was a life-changer for me. The memorizing of that psalm has helped me in so many situations since that time. My goal for myself is to memorize more scripture. I have been so blessed with the in depth study tools from this ministry. I am always blessed beyond measure when I am studying God’s Word…it is like mining for treasure as the Holy Spirit illumines the pages for me. My best devotional tool lately has been reading Women of the Word by Jen Wilkin. This book has also been a blessing because it has helped me approach the Word with efficiency and purpose. I was blessed by a Busy Mama’s bible study a while ago, but haven’t gotten back to using the studies since becoming a mama myself! I’m still figuring out the rhythm of things with a kiddo. Meanwhile, the Read Scripture app, with videos from The Bible Project, has been great. I am not a member of Mama’s refill but I love my ESV Illuminated Bible, Ligonier’s Tabletalk magazine, and my ESV Bible app. As a current member I can’t wait to jump out of bed curl up with cup of coffee and dive in to the word of God now. I find more and more my focus changing to seek God in all things. So many great resources in this giveaway! I’ve been using Professor Horner’s plan to consume larger quantities of the Word every day, and I’m finding that just hearing it more–in chunks–has helped familiarize me with its language and themes in ways that makes me better able to dive deep. (Does that make any sense?) I also am a big fan of writing it out–I must be a kinetic learner! I haven’t used that site. But I stay on track with my Bible study when I’m actively involved with other people in a study. I need the accountability. I’ve had success with online groups but really do best with groups that meet regularly in person. I use a Bible app devotional on my phone for personal daily devotions. We recently moved a few states away and between getting unpacked and settled and now traveling and the holidays, I have struggled to get back into a routine with my personal study. I have loved the Busy Mama’s studies, the inductive technique and the way you walk us through and teach us how to do it, step by step. I like using different colors to highlight words (so helpful for seeing themes in a passage), and I can really get drawn into word studies! But I also appreciate that you guide us through a specific part of the study each day, and that it has a limit, because life/house/husband/kids still need me. I was so grateful to receive Mama’s Refill as a birthday gift from my husband. I have not been as faithful as I would like to be, though. I like that it keeps my place, and I don’t feel like I’m falling behind if I miss a day or two. But I also miss the accountability of the emails, reminding me and enticing me to do my study. Sometimes I need that encouragement and prompting to do more than a quick morning devotion/prayer and to really study God’s Word. Thank you very much for providing these studies! I have many great resources, but building the habit of using them is key. “Just do it” is more than a slogan, it’s practical! The YouVersion app, RisenMootherhood Podcast and accountability. I have been incredibly blessed by being a Mama’s Refill member this past year! The focus on one passage for a whole month has been wonderful for my limited brain power (chronic illness plus 3 kids under 5). And the emails in my inbox each day provide the accountability I need to stay on track schedule-wise. I love that each lesson has something encouraging for me, even if I don’t have time or energy to look up all the words or cross-references. Thank you for all that you do! We can get daily emails with Mama’s Refill?!? This is the piece I have felt was missing, needing the accountability and encouragement to get into it every day. How do I get those? I love to do these studies! I haven’t been able to join Mama’s Refill yet, but I love having the printed books in my hands. I can’t wait to do another one. Hoping to do the Parenting Boot Camp next! I have loved Blue Letter Bible when studying verses and have used this for many studies! I do not use mama refill. I lead bible study at the local pregnancy help center so I’m always looking for good studies and tools. This year I’ve been reading chronologically through the Bible in the Message. I have done several of the Busy Mama studies in the past. They are excellent tools for getting deeper into the Word and are full of practical life application. Right now I am doing a read through the Bible in a year plan that I started last January. I am also finishing up a study on the armor of God. Daily time with God is so important to me and my victory each day. Thank you for the wonderful resources!! I like rightnow media. It’s great for me and my kids. I first discovered Pam’s studies in 2015 and led a small group of women thru 1 Corinthians 13. It was the most meaningful study we’d ever done! And little did I know (though the LORD did) that I would be implementing IN FULL within 3 months as my husband fell in to serious illness. When I saw the Mama’s Refill opportunity online I seized it along with my two daughters-in-law. Though we live in 3 different states, we have been studying the Bible “together” as we’ve gone thru James 1, Philippians 2, Proverbs 31, 2 Samuel 25 and more. I/we love the word studies and all the resources we never knew about before. So blessed!!!! I really love your paperback format of devotionals and I currently have one going and a couple more to do after. I am not a part of Mamas Refill, but in the years past I have greatly enjoyed doing your mamas Bible studies. I have 4 or so of them In print. i love that they go deep, teach depth and searching into God’s word- but in a time that is fitting for mamas! I also love the tools and methods you teach! Currently I am doing a Bible study with my homeschool co op. I also really enjoy using the Cultivate What Matters journals. It’s basically scriptural copywork, but is something I can do when I’m not in a study and just want God’s Word. Thank you for making your ministry to share a love and study of God’s Word with us!! Right now, My Mama’s Refill membership is the only reason I’m studying Word on a regular basis. The biggest blessing has been committing to do the studies with my sister and another one with my cousin, both who live in different states from me. They have memberships as well. It has been such blessing that we can study together even though we are so far apart. I am so grateful for Mama’s Refill!! The fact that I have learned so much from Pam’s studies is what keeps me going. The studies are easy to follow and teach so much. A real gift! Thank you, Pam! I am not a member of Mama’s Refill. Currently I use Blue Letter Bible to do word studies. I also really love Matthew Henry’s Commentary and Webster’s 1828 dictionary. Mama’s refill was an answer to prayer. I was hungry for a deeper understanding of His word and all of these bible studies have fulfilled that desire of my heart. I’m a visual learner so I love underlining and drawing in my Bible, which later helps to recall what I previously learned. The Mamas Refill Membership has encouraged my soul throughout the year! It has manageable studies for us busy moms!!! Thank you for this resource! I have attempted to do studies but this month I only have a few lessons to completely finish the current study. I thank the Lord that He has given me the determination and consistency needed to complete this study because it is such an encouragement to me spiritually. I didn’t think I would like to be noticed on Facebook that I have completed a study, but I have enjoyed being able to see what percentage of the study I completed each time I marked complete. That has been a good incentive to me. Mamas refill has influenced me with consistency in Gods Word because I always have a good Bible study to rely on that I can get done relatively quickly. I’m never not studying the Word, if not solely doing one of the studies, I work them in between other studies and in cracks in my day so I’m using any and all free time seeking God. My skills in that I am learning how to study the Word, I’ve noticed that I often jump into BLB during the day when I don’t understand a verse, want to dig deeper or teach one of my children. Lastly about enthusiasm… I was going through a really really hard time… like we’re talking the hardest time in my life… which I’m still working through to be honest, but I Could Not Get Out or see any hope At All and by Gods Grace, I started doing Psalm 91with mamas refill and the Lord totally used it to draw me near to Him, helped me get through a really hard time. It was quick so I could commit to doing it every day. Memorize His Word, being encouraged by it and just being reminded of His goodness. That was about two years ago and I’ve been doing Bible study ever since. Anyway sorry this is so long. Thank you!! The studies have really modeled for me how to study the Scriptures and delve deeply. But deeply into what is actually written, not what man thinks is important but what God has decreed is important. I love my Bible app on my phone! I find that I retain more when I take notes during sermons. When I study the Bible I like to look places, words or anything I am not familiar with up to help me better understand. Just finished None Like Him by Jen Wilkin. It concluded with a look at God in Psalm 139. I have done Busy Mama Bible studies for several years and last year signed up for the membership. I love being directed in how to go deeper in my study of God’s Word and I love being able to keep track of what studies I’ve already completed. Although I don’t comment a whole lot in the online discussion group, I do love seeing others insight and what they have learned. I have used Mama’s Refill all year and completed several inductive studies this year. Having all the studies in one place has made it so easy to be consistent in the Word every morning. I have been a member of the online studies for about a year. I find I’m more consistent this way. I LOVE the blue letter bible resources…Thanks for helping me explore that resource! I haven’t used it yet but did enjoy the James 1 study via email right before. I prefer to have something tangible over online so it’s difficult. I so enjoyed your study and hope to manage my time better so that I can once again participate. Bless you for all you do! My membership to Mamas Refill has influenced me positively by allowing me to feel comfortable getting into God’s word. I was very drawn to the ease and length of the lessons. It’s all broken down into bite sized pieces that allow me thinking and processing time before the next lesson. I enjoy ALL the other tools that I have beeen introduced to like the Blue Letter Bible. I love how deep each study goes and how many ways we are asked to look at the scripture. Mamas Refill does a brilliant job breaking it all down and having clear step by step directions. Pam was super helpful when I needed some guidance learning the ropes. It’s great having ways to incorporate children into the studies as well. I find comfort in us all sharing and supporting each other on the Facebook page. I also think it’s wonderful that I can go at my own speed and still feel connected. I first started because of the coloring and color coding. This is by far my favorite part and what keeps me coming back for more. I do gently wish for a more unified coloring code so that each color always meant the same thing. It has truly been a huge blessing finding and using Mamas Refill! Thank you for all you and your team does! I so enjoy studying the Word. I have absolutely loved using blueletterbible.com as it has such easy access to so many resourses. I love to do word studies also. Thank you so much for giving of you time and passion to teach us women to follow God more passionately. what tools and resources do you use that help you stay engaged and growing in your study of God’s Word? I use my color pencils and highlighters to help me focus on the words God is teaching me. I have a short term memory and I find by focusing on just one or two key words that day I can draw close to God more!!! I just joined Mama’s refill and can’t wait to learn how to study the Bible inductively. I also want to learn how to use Bible websites to study. I have been doing Bible Studies with Doorpost for years. I joined Mama’s Refill to support the long hours Pam works, and wanted to encourage these faithful ‘family members’ to continue. I found myself in a deep spiritual battle/depression, and am slowly coming out of it. For some reason, I felt inadequate as I didn’t seem to be able to complete the daily lessons in 20 minutes. The comments of others seemed deep and personal. I just didn’t think I had anything to offer this year. I’m isolated in a new home and community with little interest in in depth study. I’ll continue to be a member as I have been a receiver for so long. I’m praying that I will once again be able to do the daily studies in 20 minutes and gain strength, courage, peace, and understanding. Thank you, Doorpost, for all you do to bring Christ into all our homes! My favorite was to stay in God’s Word is to spend an extended period of time on one book of the Bible and writing it out as well as reading multiple translations. I’m just learning of this way of studying the Bible. Have colored pens and pencils. And use study helps on my Bible. What helps me to be MOST effective in my Bible Study is to set my alarm and MAKE myself get up! I really miss the free studies you used to do– those were so helpful in being diligent about my study. I learned so much! I am applying those same skills I learned from you as I just read through the Bible book by book! I love this giveaway. The journaling NT looks amazing! I am not a Mama’s refill member. I have followed Doorpost for a long time and have several of your resources. Unfortunately, I am not as consistent at Bible study as I should be. I know what to do but putting it into practice is often difficult with the busyness of the day. I do best when I am accountable to someone or a group. I like the length, size, and depth of doorpost studies. I am a member of Mama’s Refill and LOVE it so much! I have completed a couple of studies and absolutely love the course format as I can easily track my progress. It has helped me grow in my enthusiasm towards studying Scripture even more. I grew so much from studying Proverbs 31 and discovering the layers of meaning in each passage which excites me and has encouraged me to keep studying. I love that Mama’s Refill allows me to complete a study at my own pace. Despite my best efforts to complete my study before the kids awake, it doesn’t always happen. 30 days often turns into more, but as long as I start my day in the Word and in prayer it doesn’t matter how long it takes to make it through the study! Also, I tried using the kids’ activities for the first time this school year for our Bible time and my kids loved it. 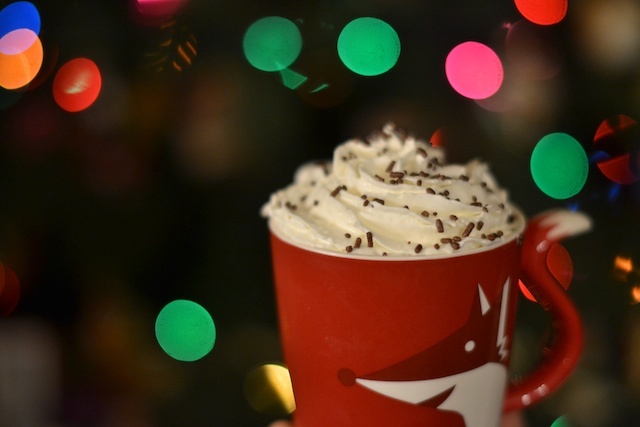 We’re looking forward to the Christmas study! I appreciate the accountability with the online Bible study. I love your studies from your blog so far, and really would like to have a membership. Have done the Busy Mamas Thirty Days in Proverbs 31 and loved it. I have not used the Mamas Refill but I do enjoying time reading through the Bible and marking and writing things in my Bible that I want to remember. I also used Blue Letter Bible to further my understanding of God’s Word. I use different devotionals that I have. I just love the Mama’s Refill site, for so many reasons! Doing the monthly studies along with other ladies who are studying has really helped keep me consistent, as I want to go and share what I learned and read what gems they gleaned from studying the same passage. My personal Bible study skills have improved so very very much! I now know how to do word studies on my own, and have more ideas for HOW to study a passage, by comparing different versions, looking for patterns and things repeated, and finally reading in commentaries. I have never in my life, been so consistent with my own personal Bible study—and I am so very grateful for the blessings that I have received. I have read through the Bible several times, and have done well using a Bible reading plan—but I honestly never knew HOW to study the Bible. Read it, yes. But study it? I had just never learned. Now not only do I want to study as much as I can, but I am teaching my sister and daughter different study skills as well, and my sister now loves Blue Letter Bible like I do! I am not a member of Mama Refills but have enjoyed the emailed studies in the past. My best times of study incorporate listening to a podcast or audio version of an interview or presentation with journaling and some reading that touches on the subject from the podcast, sermon or other audio. I participated in several of the Doorposts studies back when they were free and learned so much. I still go back and read over my notes from those studies and am blessed. I’m currently doing a study by Cynthia Heald called Becoming a Woman Of Excellence with my daughters and some other moms and daughters. I also love Blue Letter Bible. Mostly just my Bible, pen, and blank notebook. Probably need to get more tools for the new year and have a plan. Mamas refill has helped me stay consistent with my study time. I get up and do it first thing. Habits are formed. It is a very organized site and easy to navigate. I love the encouragement along the way with the badges and %meter. It is great to see it completed. I appreciate how much it forces me to meditate on the Word. I grow spiritually snd learn many new things with each study. I have enjoyed every doorposts study I have done, and staying in one part of scripture and taking the time to absorb all it has to say has been a huge influence in my personal Bible study. I also appreciate the love and patience for busy mamas that comes through in her words. I use my Bible, a notebook, pen & paper to takes notes. I also use Bible studies online. I tend to read Bible on my ohone as well as read my physical Bible. I love being a Mama Refills member!! Before finding this, I was longing to find away to find more time to spend in the Word and to learn how to do some Bible journaling. I have learned soo much from these studies and now look forward to starting my day every morning with a Mama’s Refill study!! Thank you soo much for doing this for us busy mommas!! I am not a Mama’s Refill member as finances don’t allow it right now. I have been focusing on teaching my children by reading the bible and praying. I am a stay at home mom, in a rural area, and am not connected with others in a bible study at this time. I do have some Doorposts bible study books and plan to use those to study from as well. Thank you for doing a Christmas giveaway! I’m not a refill member. I started your Psalm 91 study and enjoyed what I completed. I can’t remember why I didn’t finish it. I have a daily Bible reading plan but I’m not currently doing an in depth Bible study. I have your book “Beauty in the Heart” which I plan to do along with my daughter. I love using the busy mama bible study booklets! Those have been very encouraging. I like memorizing scripture to keep it fresh in my mind and heart. Also, writing down my prayers helps me focus and stay on track. Since I’m a busy momma of three, I don’t get a ton of time to study, but I love being able to take a few minutes to read the e-mail and then do a more in-depth study in the evening when the kiddos are sleeping. I’m currently working on being more active in the word and not letting how tired I feel get in the way. I have not used Mama’s Refill yet, but just finished Revive Our Hearts 30 day devotional series entitled ‘Choosing Truth’ and loved it. Perhaps will do one of yours next! Have done yours in the past and enjoyed very much! I have used Busy Mama in the past, I think the best part is all the extra things you have added Pam, for the children to learn alongside momma! Right now I read and study independently using the Inductive method. I have a wide margin Bible that I love for drawing verses out as memorable pictures. One of my favorite resources is Blue Letter Bible and the Matthew Henry Commentary. I read my Bible almost every day. Then I go to Blue Letter Bible site ( I learned it from you.) to study some words. I am not a member but enjoyed past studies on the blog. Conversing with God is where I like to start; He is always with us. So, I ask questions about what I am reading and look to see how to apply it to my life. (James 1:22). Sometimes I use blb.org; but not as much. Because I am trying to become more dependant on God. We are in 1 Peter right now. Recently I find myself comparing ESV and NKJV. The latter is my favorite, but sometimes it is hard to work through the wordi g or sentence structure. I pull out the colored pens or pencils for that. Journaling all that I am learning is helpful and I like to go back periodically to read through it. I need to do that more often, set a day aside to do it. I’ve made myself a “prayer” and journaling notebook which I keep track for a whole year. It keeps me motivated and accountable! 1. two different sized pen tips for journalin (I use the finer tip for my thoughts, but then when I’m writing scripture, I use the heavier tip; this way, when I’m reviewing my notes, scriptures stand out easily for me and I can reference them better). 3. Lastly, the “Valley of Vision: a Collection of Puritan Prayers” is a great directive for starting out my prayer time, or ending the day in prayer. I like to use BlueletterBible which I learned about from the Busy Mama’s Bible studies. I learned a lot about Bible study through those studies. Thank you, Pam. I have my own style but I’ve adopted a lot of what I’ve learned from Pam in regards to topical Bible studies. Writing out verses, paraphrasing them, then writing out application and prayers. I’m not a Mama’s Refill member because most of the year I do a group study. I love doing the banister mama’s studies when I have a break from my group. They are short enough I can usually finish one over Christmas and a couple over the summer breaks. I love refreshing on the word studies and remembering to draw. I’m able to apply so many of those tools in my group study! I use the Blue Letter Bible at least weekly, if not more often. It is my favorite resource at this time! I also implement the inductive study methods used in the Busy Mama Bible Studies. I use my Bible, a devotion (right now it’s a Tozer devotional), Blue Letter Bible app, and prayer journal. This year I’d have to say having an ESV study bible app on my phone has been the biggest help to me as I had my seventh baby in March and she was ill for several weeks where I was awake most hours. A lovely bright screen to help me read the encouragement and life giving balm of Gods Word while I was scared and exhausted was invaluable. As my little one has recovered, I’ve enjoyed memorizing a book of the Bible with other sisters in Christ, participating in bi-weekly bible study with others and having quiet moments alone (ish) to absorb and meditate on Gods word. I am not a Mama Refill member yet but hope to join next time around. I have many of your studies and really love your approach to studying God’s Word; but, still am not where I desire to be in studying His Word. One thing that helps me is when you open up your Bible and show just how you marked things and why. Not to copy, but to better get a jumping off place for myself. I like specifics as I explore studying this way but I don’t do facebook so that option of your group is not available to me. I tend to want it to be ‘perfect’ which instead causes me to neglect. My granddaugher journaling and studying the psalms has actually been a great help and encouragement to me. Thanks Pam, for all the books and charts that have blessed our family throughout the years. I’m new to Mama’s Refill but not new to the Busy Mama Bible Studies. I love tje variety of studies to choose from and that I don’t have to keep up with where I left off. You do that for me! I love that I can do this on my own, and that I also have the opportunity to share in a group. I like seeing different perspectives. The format motivates me to jump in when I can. And then I want to see if I can be more consistent the next time! I use a One Year Bible for daily devotions. I would enjoy the illuminated New Testament set. This past year has been filled with all “NEW” (province, church, people, life, death, illness) which has really pulled me off my daily devotional path with the the Lord but praise Him for the solid teaching I’ve received in the past years which has carried me through this valley for the most part and am now looking to get back in top of the mountain and strive to study His word daily again. I’m thankful for your Ministry which I was introduced to a number of years back by a dear sister in the Lord and have purchased treasures books for our daughter and husband (polishes cornerstones and plant grown) which are indeed treasured. I’ve not had the opportunity as of yet to take part in your Mamms Refill study but am thankful for the rich resources and teaching provided by Doorpost. May God continue to bless this ministry. I am not a Mama’s Refill member, but I have done a few of the Busy Mamas studies, which have been awesome. I use the Blue Letter Bible primarily, StudyLight, BibleStudyTools, and SpurgeonGems. I post daily biblical encouragement on our church’s facebook page. Being able to share what The Lord shows me on a daily basis really helps me to stay focused on spending time with Him. My desire is to grow more and more in Him and to see others grow as well. Thank you for all you do. You don’t know me, but your studies introduced me to the Blue Letter Bible and have helped me so much in my walk with The Lord. May God continue to bless you and your ministry! I agree with others who said meeting with others helps me set aside the time to study. I really appreciate Bible Study Fellowship. I also have done some Doorposts studies in the past and enjoy looking at my notes from those in my journaling Bible. Thank you for those studies. Written prayers from the book “Every Moment Holy” have helped me a lot too. Thank you for hosting such a great giveaway! I listen to a dramatized version of the Bible oh, and I also really enjoy listening to Christian podcasts. So I’m not a member but I have been encouraged by some of your bible studies through James a while ago :)… in all honesty my best resource in helping me grow in God’s word is my amazing husband… and then of course making the time to sit quietly and read God’s word :). My husband and I purchased Kindles on a black Friday sale last year–it makes it easy to have several translations available at once without the heft. It is also nice to be able to download reference/devotional books instantly, and have them available on once device versus several books. I keep small printed bible studies like yours, some from Kay Arthur or other inductive studies. I love my reference books and still often refer to How To Study Your Bible! I keep small bibles and devotions throughout my house, with 7 little people home 24/7 I have to sneak it in when I can! My lesson planner has a Bible reading plan to read the Bible through in a year. I try to stay up to date with that and also do monthly Bible journaling found online. I also read through the Proverbs daily with my children and we have family Bible study in the evenings. All of these items in the post look very interesting! (I’m Not a Busy Mama Refill Member…yet) The tools and resources I use to help me stay engaged and growing in my study of God’s Word are: 1) I have discovered (by experience) that the Busy Mama’s studies (print or Kindle form) are the BEST for how I learn and to help me retain information!! When I am “camped” out in the same scripture, I remember where I read that (!) and where to go (to share with others) what I’m learning!! This is HUGE for me! It brings clarity of thought. I recently tried a different Bible study that had you go here and look up this scripture, and then go there and look up another scripture there, etc. I stopped that Bible Study and returned to the Busy Mama’s studies so I could have the continuity of being in one location to learn all that was at that one location in The Word! It helps me (naturally) memorize GOD’s Word (that’s also huge!). It (again naturally) causes me to meditate on HIS Word since I’m continuing in the same place day-in and day out! I also retain information better (and enjoy) learning through the physical exercises of color coding, drawing pictures, etc. This all has honed my observation skills (in reading the Bible during Church Services, and at other times) to see patterns, repetitive words, promises, what GOD is, does, etc. 2) By far the BlueLetterBible App on my phone is my favorite electronic resource though! Since I have become familiar with it (through constant use in the studies) I can now instantly (usually) find a scripture others are trying to remember where it is in the Bible (I do this via the search), or I do cross reference studies to dig further into a specific verse GOD is speaking to me about. I enjoy the ability to have Hebrew and Greek dictionaries at my fingertips (without the bulk and weight of carrying TONS of books!) too. These are my FAV’s when it comes to growing in GRACE! I am not currently a member but many times I go back and use past studies from the Busy Mama’s Bible Studies. I love all the notes that are in my Bible because of theses studies. It is a continuing refreshment as I do my daily reading! Hi…I have not used MR before, but what helps to keep me in god’s Word is being part of a memorization group. We memorize two verses each week, and then record our recitation for each other using the Voxer app. Has been such a great way to keep me thinking on God’s Word!!! I read a chapter or two of my Bible. I also read devotions and memorize scripture with my kids. I have used one of your studies and enjoyed it very much!! To stay engaged and growing in my study of God’s Word, I daily open with prayer, then open the Word and journal what He reveals to me. As much as I can, I listen to sermon series while doing housework to keep me focused on the unseen and remind me of truth while I am “in the trenches” with a house full of children. Sermons, praise music and instrumental hymns reinforce and remind me of the Truths He is making known to me. Then, sharing with friends what we each are learning is a huge reinforcement and encouragement! Color coding and marking in my Bible really helps when I’m looking for a specific subject/topic. I love using colored pencils and washi tape to make it more artsy. Also, for in depth studying, I use my ESV Study Bible – love it! 🙂 I also have a journal that I keep with my Bible that I take notes in daily. Your studies have been vital to me growing in the Word as a Christian Woman! 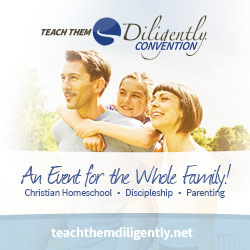 Thank you for your ministry and I would love to be registered for the giveaway! I completed some of the Bible studies last year before membership was available and loved them. However, I wasn’t as consistent in doing it every day. Since I joined in December last year, I look forward to my time each day and can hardly wait until the new study is announced each month. Thanks for making this available to me, I am enjoying taking time out in my mornings to study God’s Word! I have used many of the busy Mamas Bible studies before but have not subscribed yet. I primarily use Blue Letter Bible for my daily and weekly Bible study. My family has been watching the book of John on Netflix each night. .and that has been it. To say i am growing is not a correct statement. Hence the desire for something more. I love Mama’s Refill!!! I love the practical applications and diving deep into a passage. My favorite studies of all was Psalm 139 and Ruth. I have been a member but around March I realized I needed to make my studies offline for devotions so I havent used the site as much as I have wanted. I have been worling through Bootcamp with a friend every other week. It has been amazing for us as we encourage each other along. I think I’m going to try to print off pages for a binder so that I can do them since I love how indepth but how truly short they are. Many studies released this year have grabbed my attention. I love the Busy Momma’s Bible studies! They have taught me to use the Blue Letter Bible online which is an excellent resource. I also have gleaned much from reading through my study Bible. The notes give so much insight and clarification. I am not a member right now. We are going through a tight financial time right now. I do love your studies. I have completed several of them in the past. They were a huge blessing. My favorite tool is using http://www.blueletterbible.com. I love to study the words in depth. For several years now, when ever I hear a Scripture twice in the same day from two different sources (i.e., personal bible time, sermon, radio, friend texted it to me) I figure that God is wanting to tell me something, so I study it. Oh, I always enjoy two cups of coffee while I study!!! How has your membership in Mama’s Refill influenced your enthusiasm, skill, or consistency in studying God’s Word? I love the studies and how in depth they allow you to go in the Word. I have been a member for the year, I have been saving the studies to my computer so I can go back to do them again in the future. I like the insight you provide while doing a lesson for myself and my children! I’m currently using a chronological Bible, and I love having a journal and pens handy. I’m currently reading through the Bible little bits at a time and using the blue letter Bible as a reference. All I want for Christmas is to win this kit!! I need this to help me get back into the Word. I’m so scattered right now and my main toos are my YouVersion Bible App and my Blue Letter Bible app. I need something to write in, fill in, journal in to see daily, remind me daily, and draw me closer to God! I love going verse by verse and concentrating on a particular passage or chapter for the month. Have encouraged a number of people to try one of Pams studies but often get different excuses like I can’t read the same chapter everyday for a month. But oh so worth it when they come back and say ‘I didn’t realize that passage said that much’. Oh so worth the effort to study and find the nuggets God has left us!! I used one of your studies years ago and enjoyed it. I would love to try one again. Right now I have a Bible reading plan and I also follow along with Thru The Bible Radio. I love the ESV Illuminated Scripture journals. Those look SO amazing! I use my esv study bible and a good theological commentary to study. I have found that getting up before the herd helps to direct my day! I have done different types of bible studies, but am looking to find a study that helps me focus more on God’s Word and not so much fill in the blank. I need something simple, but deep and rich in understand God’s Word. I am so grateful for the studies you have put together. I appreciate your clear instructions, insightful summaries, and thought-provoking questions. I was no stranger to using a concordance, but when you introduced me to the Blue Letter Bible, it took Bible study to a new level. What a powerful collection of tools! Thank you for incorporating many different ways of engaging with Scripture. You have us listening to music, drawing pictures, marking in color, exploring commentaries (after doing our owns studying), memorizing, and inviting our children to explore God’s word in active ways. I wish I had discovered your studies when my children were younger. At first I was disappointed that you had moved away from having your Bible studies through the Doorposts blog, but as a member I have appreciated the ease of getting from one lesson to another and going back to lessons. It is much easier to find studies, access them, keep track of what studies I have done or days I have completed within a study. The bonus section in each study with links to articles, sermons, and other resources is very helpful. I thank God for you and the gifts and experiences He has given to you. Thank you for being faithful to use them in His strength. I have been doing some studies by Jen Wilkin, both free and paid for, to stay engage in Scripture. I have done some of your Bible studies when they were on the blog. I use a reading plan to read through the Bible in a year. I use a Women’s study Bible and Bible studies with my church. I have utilized and am so thankful for Doorposts and Busy Mama Bible studies. I went to Bible college and learned so much in studying the Bible, but a lot of it goes away when you aren’t a full time student anymore. With this study, it fits into my busy mom lifestyle yet still allows me to dig deep into the Word and regrasp and newly grasp methods to grow more in God’s Word intelligently and faithfully. The Facebook community allows all the hungry women seeking and studying God to pull together and share the nuggets of God’s Truth. Thank you Pam and family and co-workers for passion for God’s Truth and all the work you put into the Bible leading and website. I let myself get talked into being the facilitator of our ladies Bible study. You can’t neglect your own learning when you are teaching! I love listening to my Bible app in the car on the way to school. I also like to use the study questions I get from church to study our most recent sermon series. Disclaimer: This is more of an open-letter to you, Pam, then a response to the questions. We are a bi-cultural family of Brazilian-Americans. 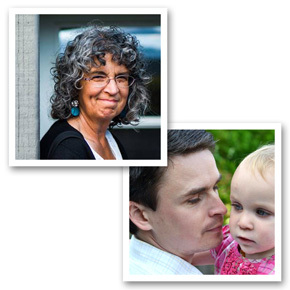 I am a former missionary teacher; my husband is a pastor. He and I, along with our four children, are currently living in the US; but all of my children were born in Brazil as it was my home for 15 years. I don’t remember how I first found Doorposts, but I think it was through a missionary friend who had some of your materials about raising children. I loved the materials (and still do! ), but what I really came to love were the blog bible studies and interaction on FB (don’t know if you remember, but we communicated directly a few times) which were a true lifeline for me during some difficult years. I am not currently a member of Mama’s Refill because of the annual fee, which I know is very little, relatively speaking, for most Americans; but our situation is very different from most. Please understand, I am not complaining! Rather, I have been so grateful over the years for the many ways I’ve benefited from your ministry. In Brazil, God provided a wonderful mentor for me in another American missionary friend…for a time, and that’s when God provided nurture and encouragement through your ministry. I much appreciated your mature, gentle-yet-direct (and ever so practical!) teaching. I loved the 30-Day Bible Studies as they felt do-able as a mother of four little’s; they were not too long to keep me from participating in a new study (as happens with year-long ones), nor too short to avoid more in-depth studies. It may be that some would benefit from a slightly longer study (as some of yours have done anyway…;), but that may not be your purpose. I do love how your studies keep the Word front and center (as a side note, I now use blueletterbible.com for my own bible study!). I’ve often wondered/wished/prayed about the idea of partnering with you in a Brazilian/Portuguese ministry as I have many dear friends who would benefit, but about the time I was really considering contacting you, life took a really big change and has yet to settle. From having a sideline seat via the internet to much of what has happened with your family over the last several years, I know you are familiar with such things. So, thank you, dear friend**, for all your encouragement over the years. I know you may not feel like one in regards to knowing me, but that’s what you have been to me. I’ve often wished I lived somewhere close enough to stop by for short yet immensely satisfying and edifying visits as my other dear missionary friend did many years ago. As it is, some day in heaven, we will get to enjoy an even closer bond being one in the body of Christ. I loved the blog but unfortunately haven’t had the money or ability to sign on for Mama’s Refill. The most useful tools I use is writing, colouring, hands on type of ways of studying. A top resource for me is the Blue Letter Bible app! Which I learned about through your old blog studies; thank you! Thanks for the giveaway, the gifts all look amazing! I use books and sometimes blogs and articles for Bible study. But the best way I learn is that I have a question that I start looking answers for. I will start writing about it…that’s when I really learn. As I write, I will look everywhere what has been written about the topic, and read different translations and use the Blue Letter Bible resources. I found the BLB through you, thank you so much, it is a great tool! I have been using these Bible studies for almost a year. I love how in depth we go and all the useful tools I’ve learned to help me understand God’s word in a deeper way. I have been working through the Colossians study with my teen and pre-teen girls. We have brand new eyes for what these words hold. My girls, own their own, drew pictures of the “put-ons” as clothing. It showed all of us that these things are a continual thoughtful effort. We are leaving this study with treasure. I am not a member of Mama’s Refill, but we do use some Doorposts resources. I find our family devotion time and my children’s questions throughout the day cchallenge and inspire me to study further. We have been working through “Polished Cornerstones” for family devotion, but adapting it for our boys as well, and I have been forced to be honest about which traits I lack! It is very humbling to then go to God and say, “I am not always patient or kind and yet I must teach my children these things; please help!” Or when studying “Brother Offended”, I have to admit that I donty always follow these steps yet I should. Then I have to search the Scriptures and earnestly ask Christ to forgive me and change me. I have loved these studies this year. They really helped me to get into a consistent study time. This coming year, I hope to use them for myself, but also for my older children, so that we can do the studies together during our homeschool time. I was introduced to Mama’s Refill by a friend, I immediately loved your studies. I liked how they began easy and became more challenging. My favorite study was Psalm 91. I learned so much about Who my God is and how He protects me. I find that using Webster’s 1828 dictionary more useful than BLB’s dictionary. There’s so much meat in this Psalm. I love that I can apply the techniques I learned from you in my own bible study (which is not as consistent). I get SO many emails – especially now – that I sometimes miss your email and have to search for it. For me, my best bet is to do Bible study first thing, before opening my laptop. If I can keep from being distracted, it gets done. When I’ve done online studies, I need to make sure any distracting windows (like email or social media) are closed down the night before, so when I open the laptop I can purpose to go right to the Bible study page without getting sidetracked. I use a Bible app for daily reading. I use online study tools such as Blue Letter Bible. I find it helpful to draw pictures when memorizing verses. I have been using Mama’s Refill and it’s nice to have all the studies in one place. My favorite part of the studies is the digging deeper, though I do love breaking out my colored pencils! The smaller lessons makes it manageable, giving me an opportunity to be more consistent. I love how its teaching me to look closer and dig deeper and find myself doing that more on other occasions. The Mama’s Refill Bible studies are great in providing a structured study time for me. When doing a study, it’s easier for me to wake up and start my quiet time because I know exactly where I need to go. I didn’t do all the studies this year in order to take a break and read something else, but my times in the Word with these studies were so much richer than when I wasn’t doing a study. I also love that being in one chapter for a while month really helps me to memorize scrioture, which is so important! I have loved your studies for many years. I tell everyone you are my favorite Bible teacher. You have taught me how to study. I haven’t completed as many on the website as I wanted to this year because I’m busy teaching others and my remaining children in our homeschool. My very favorite thing is that you donot tell me what to think, you show me how to go dig for myself. I love the charts and visuals.. You have helped me become a better teacher. Thank you. I am reading the Word, doing some bible studies, and memorizing Scripture with a friend. I have done your online bible studies in the past and LOVED how in depth they are! So thankful to have daily reminders sent directly to my inbox—so fortunate to be spoonfed Gods Word while so many do not enjoy this luxury. The studies are in depth, thoughtful and complete and encourage me to dig deeper and draw closer to the Lord through His Word. Just really thankful for those daily reminders to help keep me faithful! My #1 resource is a reading plan. I cannot go without a reading plan and checking off each day. I have used different plans over the years but I need that direction and guidance of what to read each day. One less decision for me to make first thing in the morning. On a really good day I listen to an online sermon that covers what I read that morning. Thanks for the opportunity to answer the question. I have used a few of the Busy Mama Studies and always enjoy them. I am almost finished with my first Bible study! I love it. It has just made my study time more meaningful and personal! Thank you for all your hard work you put in to this and then sharing it with all of us! Mama’s Refill has given me focus and a community so that I can study with intention. This has given me motivation to stay in the word daily instead of putting it off. I want to do it, and what I study has become personal to me. More importantly, Pam has given me the tools to feel comfortable studying Scripture on my own and I’m so thankful! I am not a Mama’s Refill member, although it looks helpful. As a homeschooling mom of 4 with a baby who still wakes at night, it is often a challenge to find a Bible study routine that works. But I have begun journaling my devotions this year, copying verses and key thoughts from Timothy Keller’s book on Proverbs. I also love the Busy Mama studies — I would love to win that prize!! My husband gifted me with my first doorposts study and I became a mama’s refill member last year. I love studying scripture through BLB and the direction I get through the busy mama studies. The clear plan that Pam lays out brings focus to my study. The tools and resources I use in studying God’s word are just the computer. I access the blue letter Bible. Thanks to you, and how you taught me to use it. I have done only your free Bible studies. Thank you for them. I have enjoyed the studies I have done. It has helped learning how to use the different tools. I have loved the consistency of having studies with great depth. I’m so thankful to have found this study because it truly does keep me filled. I use a variety of resources; your studies from the blog, some journal and doodle studies and an inductive study method. It helps me to slow down and digest the Word. The tools help me to better understand the Word. Thank you, for the site! Doorposts has been a trustworthy teaching resource for my family. It is critical as Christ followers that we test everything and many “Christian resources” (especially for women) are not valuable. I am thankful for The Forester Family and their deligence in this ministry. Mama’s Refill has been such a blessing & a great way to keep digging deeper. I look forward to each daily email to dive in. I absolutely love these Bible studies. I am a Pastor’s wife and I have been able to encourage our ladies to get this and also it has helped me to grow in my own knowledge of God’s Word. I can’t wait for the next days study. The pictures and markings in the Bible have helped me the most. I see them and remember what I had learned. Thank you so much for doing this! It is priceless to me. I love mamas refill! I can study at my own pace and include my children. Thank you for this wonderful study that has helped me learn to really study God’s word! I am grateful for all the work that goes into your Bible studies. I am a member, but must confess that I have yet to finish a study. I’m not giving up though. Your studies have taught me to love my bible and make it my own, and that it’s ok to mark it up (gasp). I enjoy opening my bible now and seeing color and personal meaning throughout. I also enjoy BLB and how much deeper it takes you. Thank you!!! I started studying the Bible inductivly when I was a child, thanks to my mom. When my kids were younger I was blessed with attending a precept study with ladies at church. Since starting to homeschool, that is no longer possible. I’ve loved using Busy Mama’s Bible studies on my own and with friends in the past. This year I’ve been blessed with the online Bible studies through Mama’s Refill. What a wonderful way to use technology to bless and encourage one another. I’ve always been the most faithful at studying deeper in the Word when I have friends to encourage me. I think my favorite tool is key words and lists. I also love the suggestions for doing it with your kids. I want to pass good Bible study skills to my children like my mom did for me. I am a Mama’s refill member. Your studies have really helped me slow down and focus. I love searching for words and drawing illustrations. It is a challenge for me to have to pull out my laptop every morning though. Are there any plans in motion for an app?? I currently am not on Busy Mama’s bible studies, but I did a few studies thru your blog. I am currently in a couple of bible studies with ladies from church. I really enjoyed the one that talks about how your heart mind, physical and emotions are all related. I used index cards for memorizing the week’s verse. My other study is all studying from the Lord’s Word. He always comes through with the scripture. When I am having a rough week, he always provides just the right verse or verse I need for the day. Praise the Lord for His Word. The Busy Mama Bible Studies and having the right Bible have been integral for me. I love being able to purchase the printed and bound studies from your site. 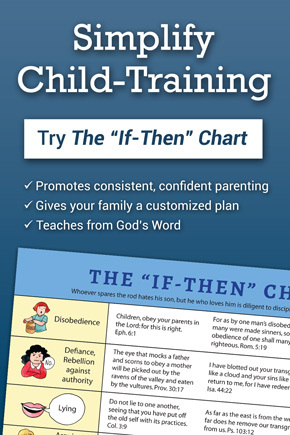 They are perfectly formatted to make regular Bible study truly possible for a busy mama. Previously, I did not see the need for having more than one Bible, so I stuck with my big study Bible. However, I have realized that having an ESV journaling Bible, one that I am comfortable writing and sketching in, makes me more likely to actually study the Word. I am not a member of Busy Mamas Bible Studies but they have intrigued me for some time. I have even bought two of the studies; however, I haven’t done them. I struggle staying in the Word on a consistent basis. My mind tends to wander, unable to focus, and I get frustrated and give up. I do try to use my YouVersion app and have enjoyed digging in with the Blue Letter Bible app. These resources look great for studying the Word in depth. The Busy Mama Bible studies (and now Mama’s Refill) have helped teach me how to dig into the Word. The studies have taught that I am a valued Daughter of the King, and that “His steadfast (merciful, kind, faithful) love (for me) endures forever.” Being in the Word daily has helps me to remember this very important truth. The Child Training Boot Camp (2) also helped me to realize that what comes out of my children is what they’ve been filled with. So, I need to diligently fill my adoptive daughter with God’s love and care to squeeze out all the ugliness that she endured during the first five years of her life. I’ve gained so much from these studies. They have been a huge blessing!!! I was gifted a membership almost a year ago and it has been nothing short of amazing. It has really grown me and has really helped me to understand and navigate the bible better. I have learned so much this past year and the studies are amazing. It’s very hand to have and even be able to take it on the go (or on a cruise!!). I am blessed by this membership and I cant wait to see where the next year takes me! I have been so blessed by MamasRefill bible studies! The inter linear tool on blue letter bible has been so enlightening! I love understanding what certain words truly mean in their entirety. It reminds me of the complete inerrancy of the Bible; that the authors (by God’s working) chose these specific words for specific reasons, and they are not to be changed! I love my Mama’s Refill membership!! It is so easy to keep track of where I am, and see what I’ve accomplished. I especially like not having the emails in my inbox — and I no longer feel behind since those emails are not piling up. THANK YOU for all of your work! God is clearly working through you to benefit so many ladies like myself!! I love doing these studies! Getting a daily email assignment helps me to be consistent in my study. I have also enjoyed having additional studies on the site that I can do in between the “live” studies, though the live ones are definitely my favorite. Studying with others in real time is so helpful and motivating! I have really enjoyed using Mamas Refill! My favorite new thing I have learned in it that has really helped my study time is how to use the Blue Letter Bible! It is so neat to be able to study and find the real meanings and new concepts. Thank you! Did some of the studies before Mama’s refill. Struggling at present to find a way to get into spending time in prayer and studying God’s Word. Reading with a journal to write in seems to be a good way to keep me focused and remember something. Not a member of Mama’s Refill, but have a friend who is and loves it. What’s helped me most recently to stay consistent in my reading (though it’s still an area of weakness for me) is the Bible Reading Challenge reading plan from the ladies at Christ Church in Moscow, Idaho. They encourage you to not worry about catching up if you miss a day — just jump back in with today’s reading, knowing you’ll be reading the Bible for the rest of your life and will eventually come back around to whatever you missed. I’m not familiar with Mama’s refill but I have completed several of the Busy Mama Bible Studies and have enjoyed them. As a family we read a Psalm together daily and I am currently part of a bible study group. “How has your membership in Mama’s Refill influenced your enthusiasm, skill, or consistency in studying God’s Word?”- I love the different tools that are used- BLB being one that has truly changed my interaction with the Word. This and other tools that Mama’s Refill has used has really encouraged me to feel capable to go deeper in my study without being a scholar. I have really enjoyed the studies. I really enjoyed going deep in the word and having time to stay as long as I wanted. But after having kids I found out that I did not have much time and getting in the word in depth was not happening. But I thank the Lord for you guys and for you, Pam, for being obedient to the Lord. God has shown me through your studies that I can still go deep and receive the richness of His Word 10 min or what ever time I have. The way your studies are done it really helps you to meditate on it and it truly get ingrained in your heart without you really realizing it. Thank you again. I had two questions. 1. Once the new studies come out will we lose the old studies we have done or are working on? 2. Is there are print friendly way to print the studies. I would love to print them and keep them especially since I have been doing the child boot camp studies! It would be great to be able to go back and do them with me kids and it would be easier to get especially since I like to take notes. Also at times my internet acts up and it would also be nice not to have to look at a screen while trying to read my word. Less distractions the better. Once again thank for your obedience to God! May you continue to be blessed with the Presence and joy of the Lord while you continue to do His Will! I love Mama’s Refill. My enthusiasm, skill, and consistency in the Word has greatly increased because of these studies. More importantly, my relationship with the Lord has deepened. Thank you, Pam, for the work you put into the studies. I greatly appreciate it! I’m not a mama refill subscriber, but I have done a busy mama bible study. I love the Scripture Typer App for redeeming small moments in my day, especially when laying down with kids until they fall asleep. I have only recently learned about Doorposts but am anxious to try your materials for myself. Currently using Bible Gateway, The Bible App, AllThingsNew app, and various study Bibles. I am not a member of the Refill site but have enjoyed the studies in the past and have several Doorposts materials that have helped me tremendously over the years. I keep myself in the Word early in the morning with a chronological reading plan from Blue Letter Bible, and engage in a few topical studies throughout the year with a group. If I had more time I would go back to inductive studies such as Precept, or more of Pam’s studies. They are truly wonderful! I have enjoyed being a part of the Mamma’s Refill site. It has been great having a place to go with easy access to the different studies. I need to get a little more diligent about it, but I do love having it all right there and keeping track of my progress. I love the inductive study style. Mama’s Refill has helped me to organize my time in the Word and utilize my time wisely. I’ve learned that each day of study is going to look different than the previous day, and that’s ok! I’m encouraged and convicted through each of the studies I have completed. While I haven’t completed as many studies as I thought I would have, I have grown exponentially. I love the variety and the resources. Thank you for the prayers and all the hard work to keep Mama’s Refill going! I haven’t joined Mama’s Refill yet but I have done a couple of studies through your blog. I love using Blue Letter Bible and am grateful to you for sharing it! Some things I do… I get an email every day reminding me to read so that I have no excuses (I used to get going on all my daily tasks and would realize after going to bed that I hadn’t read all day! ), and I read with a notebook, highlighters, and pen in hand. Something about having a pen in hand makes me more alert and makes me want to take notes! I look for commandments/good character, warnings, responsibilities of wives and mothers, prayers and praise verses, Messianic prophecies (either prophecies in the OT or fulfillment in the NT), and verses about either blessings, healings, and promises (such as Philippians 4:6-7). I also recently started noting what the different characters’ names mean in the margin of my Bible. I look them up on Blue Letter Bible and then read on to see if their story fits their name. Finally, my church teaches college-level Bible classes, and I bought the manuals for those and keep them handy as I’m reading. I am really enjoying Mama’s Refill. I love how it is teaching me to use different Bible study methods, such as word studies. One of my favorite elements is the suggestions on how to study the same topic with your children. It has been a huge blessing to me and makes our family Bible study so much easier. I look forward to completing more lessons and drawing closer to the Lord. I love being part of the Mama’s Refill because Pam’s studies give me solid ways to learn from the Bible. I pray to be more diligent, but the learning I have done helps me anytime I go to the Word because I now know how to use the Blue Letter Bible. I appreciate that there is no shaming for falling behind. I also love the encouragement from the women of the group. I’m not currently a member of mamas refill. Honestly, mine time in the word has been sparse. Up until last week my youngest was still co sleeping with me and so time alone has been minimal. I have tried studying directly after breakfast while giving my boys (one just turned 3 and the younges is 16 months) take to play in the play room but it seems that I spend more time interceding versus reading. One thing that has helped me get in the word is doing a bible study with my local moms group. Having to be prepared for discussion with them I am more adept to spend time in the word at least doing my weekly study which is really rather short. I previously was doing some of the busy mamas studies but have since gotten off track with them. I really enjoy having someone to do them with and it helps with accountability. I hope to have more alone time now that my youngest is venturing to sleep in his own bed! I have thoroughly enjoyed Mamas Refill as it helps me to have a starting place of study and a go to when I am not certain what to study. Also I really have appreciated the bonus materials I would not find on my own because of time restraints. I have enjoyed the Word studies, as well as coloring different words and comparisons Mama Refills points out. I also appreciate the section on what you can do with your children. Mama’s Refill makes me a lot more productive in my study time! A starting direction is so helpful – it jumpstarts my time with the Lord and focuses me. I have been a lot more consistent since starting to study along with Pam on Doorposts. I love the new tools and resources like Seedbed, BLB, and Spurgeon’s Treasury. One thing I notice about myself – I tend to fall behind about half way through and my motivation lags a bit – the Facebook community helps to keep me chugging along! I really liked the shorter study on Psalm 1, and would like more 2 week studies on shorter passages – but I do really love the depth of spending a whole 30 days in once place, too. I own those passages in a unique and special way after studying them so long! 🙂 Maybe I just need to try a little of a different study then return to finish the first? Or develop more my stick-to-it muscle more! I am working on more short, simple studies, Joelle. It’s hard, because there’s so much there, and so hard to not keep digging deeper and deeper. Does it help if you just tackle a study on your own, outside of the group studies, and work at your own pace? Or maybe your 2-week mark is when I start getting carried away and start making the lessons too long? I’ll have to pay attention to that. Yes, I can understand how hard that must be! Once I get started on a day’s study, it’s hard to stop for that very reason, so I can imagine your predicament as the author! 🙂 And I very much appreciate the work you do. I actually find that I do better with the facebook group. When I study on my own, I often get about halfway and then never really finish – or am less consistent and if I do finish, it may take 3 months (due to the inconsistency). With the facebook group, I fall behind about half way but usually finish! (Like right now, I’m just two days from finishing Psalm 118 – and starting the Luke 2 one with my kids in the meantime). This is definitely my issue and not you or the studies themselves! And I do love it when I have finished, and my Bible shows the beautiful results. I’m not a member but i have done some of your Busy Mama’s Bible Studies. They’re great! I use Blue Letter Bible & The John McArthur Commentary. Thanks for offering this giveaway! I am not a member of Mama’s Refill, however, I have participated in some of the studies in the past. I like using Blue Letter Bible to help with Bible study and I learned about that site through your Bible studies! I have learned so much from your studies Pam. My first was Proverbs 31 and I can honestly say it changed everything for me. My favorite resource you taught me to use is Blue letter Bible app. I love studying line by line and using the app to look up words to truly understand their meaning. You’ve introduced me to various tools and techniques and taught me how to actually study the Bible. And I’m just so grateful! I use my Bible and some notebook paper to study each day. I have done a study with you before it became a subscription service and learned so much. I love using the Blue Letter Bible app and having access to all the commentaries and such. Hands down purchasing my membership was one of my best choices this year. I love love love the simplicity, yet the depth of the studies. I love the expository teaching style, learning line by line God’s word has been such a blessing to me. Thank you, Pam for sharing your gifts with us. I found your Bible studies when they were a blog, and held off on a subscription because the financial concerns. After several months, I missed the depth of your Bible studies and the insight that you encourage. I like how do you point us in the direction to find information, but do not give us answers. It strengthens my thinking muscle. Thank you, and I look forward to another year! 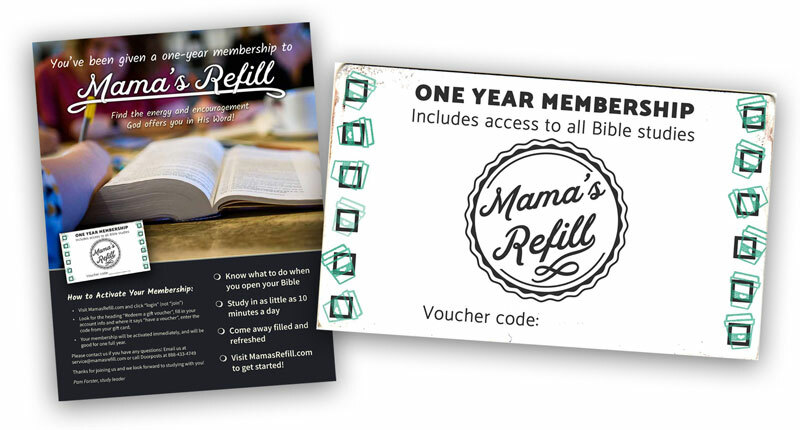 How has your membership in Mama’s Refill influenced your enthusiasm, skill, or consistency in studying God’s Word? It has enabled me to stay consistent with staying in the word of God and I have discovered many new things using the Blue Letter App. Which, beforehand I knew existed, but never really used! Also, the encouragement written in the lessons are confidence building and supportive of where we are in our walks. I absolutely love Mama’s Refill! It is the perfect combination of realistic study time and yet in-depth, non-cheesy, serious learning. I love the new site because it tracks my progress and gives me access to all the studies at any time. I have been taking a break the last 7 weeks with my newborn, but I can’t wait to get back into it in January! I use a variety of methods- sometimes I do a study, like a doorpost study, sometimes I focus on a topic and read a book or two in the topic, like prayer, or sometimes I just read the Bible to my kids. Having a membership to Mama’s Refill has really encouraged me to “dig into” God’s Word. I was saved as a child and have faithfully read my Bible daily as an adult. But now, I am really studying God’s Word: looking into the actual meanings of the Hebrew and Greek words, examining the cross-references, and contemplating commentaries by well-respected Bible scholars. My time in God’s Word has increased exponentially. As a result, my love for my Savior has grown deeper, and, I pray, I am being conformed to His image more and more with each passing day. The Proverbs 31 study has been instrumental in my seeing my God-given goals as a woman and blessing my family by aligning my actions and attitudes with God’s Word. Being a member of Mama’s Refill has influenced by skill in reading the Bible! I have learned to slow down, to consider verb tenses, to look for repeated words, to study the context of a passage, to use colors to draw my attention to different patterns– all of these things help to bring out the layers of meaning. Even a short passage of Scripture or one chapter of a Bible book have come alive through the in-depth method of study presented through Mama’s Refill! I am so thankful for the teaching and the effort you put into making this doable for busy moms who used to have time for in-depth study before kids. Now, you provide the help I need to keep pursuing Christ and all of the richness His Word offers, and you provide a way to take my kids along with me in study. I’m grateful! Oh my…where to start? Mama’s Refill has helped to keep me consistent in my Bible study through the emails and marking lessons “complete” (I love that!). I have delved into passages of Scripture which I might otherwise have skimmed over, and I have incorporated my children in Scripture memory. I love this website! I have been using Mama’s Refill and found it well worth the cost of subscription. I enjoy how deep we really get into the word. A 30 day Bible study usual takes me 90 plus days. I don’t worry about being with the group, but keep plugging along at my own pace. I rarely utilize the FB group, but do go back and check on certain days when I wonder about others’ insights. I have enjoyed several new in-depth studies and going at my own pace an not feeling “behind” in my study. I can hardly wait to do a new study. In the meantime, I use the skills I have learned to do a study in a different chapter at my own pace. I am enjoying how much grammar can help me study God’s Word, by looking for certain parts of speech like verbs, prepositional phrases, etc. I’ve enjoyed Doorpost and Busy Mama studies in the past. Currently my favorite bible study tool is the blue letter bible that was introduced to me through one of the Busy Mama studies. I enjoy using the 90-day through the Bible program. It helps me refocus on the whole of God’s Word. I have really enjoyed Pam’s Bible Studies. I did some when they were on the blog and now have taken advantage to be a member of the Mama Refill. I have always liked to mark in my Bible, as things start to stand out, but the drawings are really something. : ) Through Pam’s encouragement, I have made myself a little chart with symbols to mark certain themes and other things. I like the digging deeper… right now I am just using Pam’s methods and getting deeper into Hebrews on my own. It has been a rewarding journey. Thank you, Pam, for being the older woman who mentors us younger ones. I have enjoyed Mama’s refill, but struggle with consistency without a consistent time to do it. It seems with my little ones needs and schedules always changing, that once I’ve found a time that works, things get changed up again. Currently, I’m in the middle of changes again, and hope to get back to it. What has helped me the most is that I feel like I actually have something to take from my study to think about the rest of the day. It actually sticks with me whereas just reading through a passage, doesn’t always have the same affect. I have not had Mama’s refill before. I did the John15 study as it was posted the website. I currently meet with ladies at my church on a regular basis, usually weekly. We use different study guides for a general direction and many of us listen to sermons online (I use sermonaudio.com) some times that is all I can do with my large family and everything that needs to be done. I also use audio Bible, and any book I can manage to grab and read between crazy moments. I desire to use one of your Bible Study studies and would love to be in the Mama’s Refill! Right now, I use The ESV Psalter Journaling Bible and I use colored pencils,stickers and washi tape on the side margins. I see things in pictures so it is so helpful when I write out the verses. I remember the verses so much more and are able to meditate on them. Thank you for your ministry in helping us ladies get in the Word! I use an ESV journaling Bible, as well as the She Reads Truth App! I love having a go-to Bible study that I know I can trust to challenge me and grow me in my walk with the LORD. They usually take me longer to finish than 30 days, so there is always another one waiting for me when I finish. My refill membership has definitely helped in consistency since I get my study in my email every morning – it makes it easy and convenient. Also, seeing all the studies makes me excited to get into the Word. I have also loved sharing the study books with others to encourage them! These studies and my membership to Mamas refill has been a blessing. I love using highlighters, fine point pens, bible dictionary, & Blue Letter Bible online to study The Word. I am not a Mama’s Refill member, but I stay engaged in studying the Bible by attending Bible studies at church, reading Christian books, and doing Bible reading plans on the YouVersion Bible app. I do not have a mama’s refill subscription. I rely on,books recommended to me by others or on blogs to help with my devotion times. I like a few blogs. But I rarely have time to spend a lot of time reading them. I want to like podcasts. But I just find I never take the time to listen to them! I have tried several different studies and journaling and a binder. Currently I do not have an effective way. Some blogs are great but I have trouble with consistency. I’ve been a member since April this year after hearing Pam on a Poscast. I have LOVED having this resource! I have never been good at studying the Bible and this has been a game changer for me. It’s been so relavent in my life and I LOVE that it breaks each passage down verse by verse and that you take a whole month on one passage of scripture. This has truely brought me to a whole new place in my relationship with Christ and my knowledge of the Bible. Thank you for the good work that you do for us busy moms!! I love Mama’s Refill!!! Where else can you get access to so many wonderful studies for such a low price! While I have not completed many studies this year, due to the fact that our family participates in the National Bible Bee, the ones I have done are incredible. I love having a mentor who leads me to go deeper and know God more. I love the encouragement to press on and memorize God’s word. I love reading others thoughts on different passages and I love the accountability. Thank you, Pam, for using the gifts God has given you to encourage us to study His word and become more intimate with our Maker. I have really enjoyed the bible studies. I think having some direction and help in what to study and how to study and use the tools on different sites has been so helpful. I have learned so much with the guidance of these studies. I love the Blue Letter Bible on line that you used in your James study last year! It helped so much to really dig in!! Mamas Refill has helped me become more fluent in studying the Bible on my own, specifically by teaching me how to use BLB and what to look for when I pull out my colored pencils. ❤️ I even attempted a study on my own this summer to see how I could do on my own! It went great! Thank you Forster family!! I’ve been doing a weekly bible study locally and it’s been helpful for me! In addition I’ve been using children’s resources with my kids to help me as wel! I stay in pursuit of studying God’s word utilizing the Busy Mamas studies, Morning and Evenings devotions, and Ligonier online studies. I have not used these resources before, but I have been searching for resources that will help me understand and delve into the scriptures more, allowing room for note taking and observations. I do not use your online resources but have reviewed and continue to use your materials along with Bible study. I am part of another online group and have been leading women’s studies in our public library. I thank you for sharing the wisdom God has given you with us. I pray that many can be blessed by your give a ways. I don’t need anything but love to share. God Bless you. I would love to be a Mama’s Refill member. I absolutely love the Busy Mama books from Pam as they incorporate my children and make it seem a lot less daunting to try and make time when they have gone to bed! I had originally signed up for Mama’s Refill because I wasn’t in God’s Word at all. I completed an embarrassingly few studies and then stopped. Not anything due to the study itself, but because of laziness on my part. Several months ago I got back into just reading the Bible, doing a study at church, and also a side study to help teach Sunday School. There are a few things that I have learned from Mama’s Refill and continue to use in my own study (which is growing) and that is how to do inductive Bible study and use Blue Letter Bible. These are things that were new to me, and maybe that was a part of my not sticking with it, seems like it took more work for me to get into the study and focus on each word. I will continue on and commit to doing more this next year than I did in the previous. I haven’t used it as much as I planned. I really WANT to, but I haven’t made it a priority. When I DO use it, I love it. I enjoy reading what others have learned on the Facebook page. I am trying to make a better effort in this endeavor. I love that you integrate the kids into this. We have done it a few times, and the kids enjoy it. Love the ESV journaling books. So helpful! 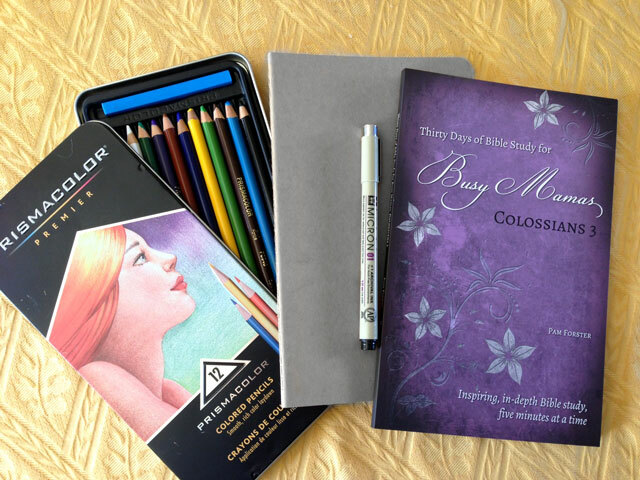 I typically do the studies that are included in my ESV Inductive Study Bible, using my Micron non-bleeding fine tip pen and Prismacolor colored pencils, all of which I think I was introduced to by doing several of the Busy Mamas books and Doorposts online studies a few years ago. I never was one for writing in any book–especially a Bible!–until I got this Bible that was designed for exactly that purpose. Now I can’t believe I waited so long! I find I like marking up the text and it’s really rewarding and encouraging to flip through and see all those colors and notes … not to mention helpful to have a record of my insights and discoveries when I return to those particular books or chapters later, like in my weekly Bible study group at church. And on occasions when I need to research a burning theological question, I find Strong’s Lexicon on blueletterbible.org, to be a particular blessing. Wouldn’t have known about that resource without Doorposts! Thank you so much! I love your studies, Pam! I have found Blue Letter Bible to be very helpful which you introduced me to. Your studies have also helped me pick out more details in Scripture because of the markings and drawings you have us do. Thank you for all the work you do on these! I love Blue Letter Bible app!! Thanks to you, Pam, is your very first Proverbs 31 Busy Momma Bible Study, you taught us how to use it! I use the app often for personal study and for clarity even during church sermons! Best resource ever with so much information right at your finger tips!! I am a Mamas Refill member. I benefit greatly from the structure there. It helps me a lot to stay on track. I never want Bible stidynto be something I just check off my list…but I definitely need structure and having it here is wonderful!! I am not a member but have been seriously considering joining so I can have some guidance for consistent reading and studying of the bible. I have been reading a bible study book thats gets you through in a year ofherwise I just open the bible and read a proverb or psalm. I love my journaling bible and my colored pencils. Thank you for the time and effort you put into these Pam! May God bless you for helping so many of us get Into Gods Word. I have been using Bible study books from women of the word written by Sue. I also have been using my Bible app and reading through the Bible in a year. I haven’t used mama refill bible study but I use you version bible devotions and I just started using a thankfulness prayer journal. I also love fun pens to keep it colorful! I do my devos in the morning before my kiddies wake up! I use Blue Letter Bible and I use various study guides, notes from weekly church services, or whatever God lays on my heart for a monthly Bible study I teach to teen girls. Helps me keep on keeping on. I use a Bible reading plan to help me keep in touch with my Bible! I don’t typically like to use online study tools since I homeschool and my youngest has 1p36 deletion syndrome, which means she needs 24/7 supervision and being on the computer just doesn’t work out very well (which is why I am last minute with this comment!) and I would rather use books than be on my phone since there are too many distractions with that for me. I am excited about the items in this give away! Even if I don’t win any of them, it’s given me great ideas to give my hubby for Christmas gifts!!!! I have not been as consistent this year as I hoped I would be with using Mamas Refill. I absolutely love the idea and opportunity, and like I just read from another comment, “I’m not giving up!” My boys and I started the Luke 2 study yesterday and I can already see the profit in doing this together. I think my main struggle is to not be distracted by all the choices out there and just stick to one thing. Moving this mountain of Bible literacy takes one spoonful at a time, I recently read in a book by Jen Wilkin. That was the encouragement I needed because my indecisiveness can be a discouragement at times. However, there is one solid resource for Bible study that the Spirit brings back to my mind time and time again. Doorposts. I have been blessed GREATLY by your ministry through the years and am eager to persevere through these studies and finish well. Thank you for the time and effort you put into guiding women in this needful discipline. Then I use a Bible app called youversion which lets me know which devotional my older kids are using. I use it mostly to supplement during times that my church Bible study is not in session. I love how systematic and FILLING it is. I gain so much insight reading passages over and over looking at didn’t aspects. I’ve enjoyed Bible Doctrine by Wayne Grudem and the Read Scripture App. MamasRefill is such a special place! I love how thoroughly we dig into Scripture and how I’m encouraged to research and think and pray constantly. And the suggestions for getting my kids involved in what I’m learning (at their level) is unlike any other ladies bible study I’ve ever been a part of. I use my Bible & a journal. Writing the Scriptures out & doing word studies are very helpful to me. I looove Mamas Refill! There are some mornings when knowing I’m getting to open God’s Word through one of these studies is what gets me out of bed in the morning! My favorite part? The doodles! Such a fun way to connect with scripture.